(Tarboro, NC) World Cat has announced the introduction of its latest power catamaran: the 280CC-X. Owing to its advanced design, this center console, 27’ 6” boat is the first World Cat to carry the “X” designation. All new, the 280CC-X takes the smooth riding advantage of a catamaran and brings it to a new level of luxury and performance. 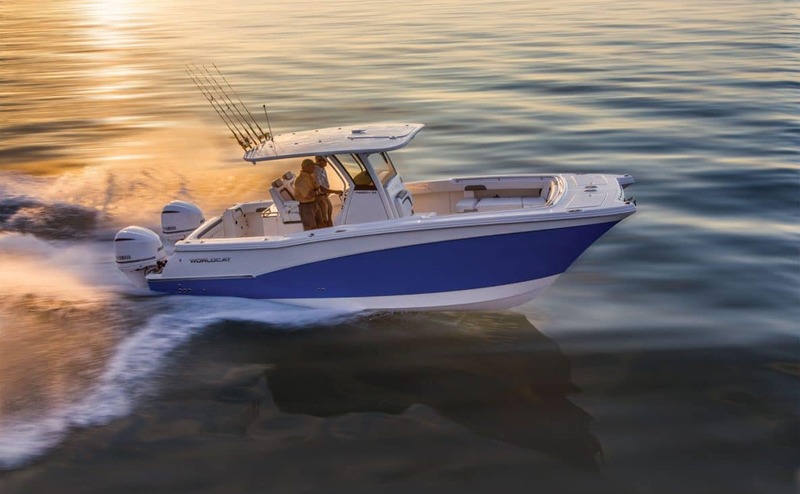 The product of more than a quarter of a century of experience building the most innovative boats in the industry, the 280CC-X was designed with input from longtime boat owners and dealers, with the goal of taking a large step into the future. It features bold, aggressive styling, the latest technology, unequaled deck space, and the soft, stable ride that World Cat builds into all of its catamarans. For the 280CC-X, World Cat designers and engineers used an all-CAD approach to create an exceptionally stable platform with an all-new hull that provides a smoother, drier, more responsive ride in all types of conditions. Luxury and style were key considerations in the design of the 280CC-X. Styling innovations include a sleek, graceful sheerline leading to a tumblehome aft, a swept-back glass-dash console topped by a surfboard-edge hardtop, and culminating in an aggressive, one-of-a-kind bow with integrated docking lights and a through-hull anchor. A CZone® digital switching system, traditionally available only on larger craft, enables full-boat control with touch- screen convenience from one location. On board, boaters will find characteristic catamaran abundant storage and vast deck space, including best-in-class bow seating outfitted with richly textured upholstery with raised stitching. For comfort, a spacious, brightly lit head with a full 50” of headroom is accessible through a wide side-hinged door. And based on owner input, two large compartments in the aft deck allow easy access to mechanicals. The 280CC-X will make its debut at the Fort Lauderdale International Boat Show, November 3-7, 2016, in Convention Center booth #2053. It will be made available for purchase and delivery in 2017. The 280CC-X is available for media testing and review upon request. World Cat is the world’s leading manufacturer of power catamaran boats with more than 80,000 customers around the world. The origin of the company can be traced back over a quarter of a century to the beginning of its Glacier Bay Edition boats in America’s Pacific Northwest. World Cat boats are precision crafted in a state-of-the-art 140,000 sq. ft. facility and sold through a network of independent dealers throughout the United States. World Cat is headquartered in Tarboro, North Carolina.